National Federation of Municipal Analysts 36th Annual Conference! To view the program for this event, click here. (complete registration form, and click on "submit"). Contact Lisa Good with questions - 412-341-4898 or [email protected]. To receive the Member Discount on Registration, you must enter your username and password. If you are completing this form on behalf of a member, please take care to enter the member's username, password and contact information. At the end of the form submission, you will be given a username and password. Please keep that information for future reference. If you would like to join the NFMA to receive the Member Discount, please do so at www.nfma.org before completing this registration form, and wait for confirmation of membership, including username and password. 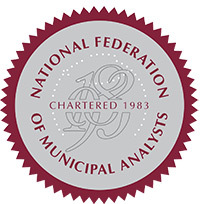 By providing your email address, you agree to receive emails from National Federation Of Municipal Analysts.